It is now six months since the free trial began, and time to draw a line under this. The service has hovered around the break even mark, finishing a few points below. It is fair to say that these results are disappointing, but I have followed several football systems with odds-on selections over the last few years and I know some of them do have lengthy docile periods. The key with skinny odds systems is the same as any other, which is ensuring that value is still achieved, and the author Carlo Manzoni, a full-time betting professional and part-time music teacher based in Rome, claims that this was impressive in the period before launch, and I am certainly happy that this is no false claim, as it was monitored by his partner John Baker, founder of the award-winning football betting advisory service Banker-Bets, who I have known and praised on this website over the past couple of years. Premier Football Investments utilizes highly sophisticated statistical-analysis software to create a daily short-list of football betting opportunities with the highest value odds. All potential selections are then subjected to further detailed analysis of numerous intangible, human factors that can’t be accounted for statistically, maximizing the ability to provide safe, steady profit betting on world-wide football. Beginning on August 13th, 2016 PFI achieved some impressive early results from world-wide football in Asian Handicap, Over/Under and Match Odds betting markets. Asian handicap betting can be somewhat hard to get your head round, so if you’re not familiar with it, there’s a handy explanation HERE. Official results are a little better than that because of odds differences, but not significantly. As the service is run by John, it is efficient and transparent. However, at the end of the day it’s the results which count, and with six months of testing under our belts, this can only be given a fail. However, should this take a turn for the better in future, which I think is entirely possible, I will bring it to the attention of CashMaster subscribers. 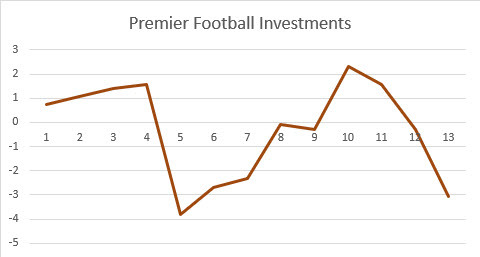 Premier Football Investments – second review. This is the second review of this service. In the first review Dave stated, “The service has hovered around the break even mark, finishing a few points below”, nothing has changed as this statement summarises this trial too. A simple service, you get an email containing the (odds-on) selections, which you then place at the best price you can. The quoted prices are usually available, but not for long, so you need to react to the email quickly. The service bets on football world-wide using Asian Handicap, Over/Under and Match Odds betting markets. From the profit graph, you see that the service can work, weeks 1 through to 3 and 5 through to 10 demonstrate this. The problem is week 4 and weeks 10 through to 13 undo all the hard work. Further, as good as weeks 5 to 10 was, this made 6 points! With the six months of the original review and three months of this review, in nine months the service has not made a profit. OK, apparently the selection process has been changed, the results, however, haven’t. Whilst, like Dave, I can see the potential, unfortunately, the original categorisation of failed remains. You can sign up for Premier Football Investments HERE.